When you are doing movie marathons at a film festival, you often forget what you are going to go see. 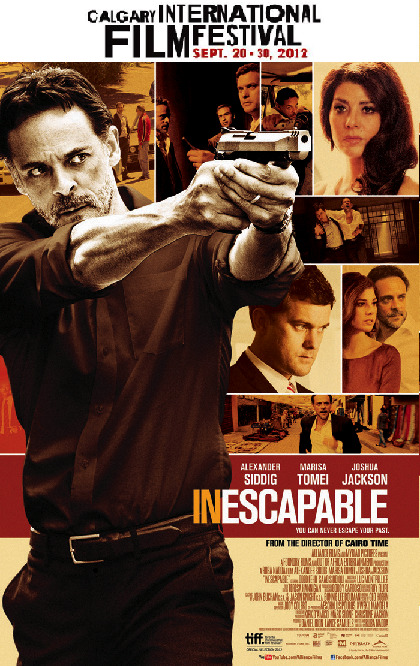 Last night I went and saw Inescapable. I couldn't remember what the story was, just that Joshua Jackson and Marisa Tomei were in it and that was all I needed to know. As soon as the movie started I remembered...I had already written about this film when it premiered at TIFF. It was the Middle Eastern version of Taken - without Liam Neeson. It was the most pleasant surprise of my weekend. A Canadian man's daughter goes to Syria to find out more about where her father came from. Unbeknownst to her, her father was actually a former secret police agent who left the country because he was accused of being a spy. She then gets kidnapped and he has to go back to his home to find her. So in the end, besides the fact that it is a man looking for his daughter, has a combat background and it's a one word titled movie, it wasn't really anything like Taken. There was more depth to the story and A LOT less killing. Like a sad amount less. Let's just say it was ten thousand times more realistic than Taken. Anyone else going around killing every third person they meet would seem so far fetched it it wasn't Liam Neeson doing the executing. Don't get me wrong, there was action and suspense. There was blood and chases, but there was a life there as well that we were able to explore. I must also note that Marisa Tomei was fantastic, as usual.